This was our final visit of the Historic Graffiti survey – specifically to photograph the inscriptions on the back of the north tower door. Just three of us needed for this task – myself, Darren and Andy (Dave couldn’t make it this time). Working meticulously through the record sheets previously produced by Andy and Dave, we were able to identify and photograph all the marks recorded. The door consists seven horizontal backing boards, but only the top five boards have have inscriptions. Altogether though, 70 individual marks of various kinds were recorded. These included 54 carved initials and two, seemingly contemporary dates (1643 and 1634). The rest were faintly scratched shapes which include many inverted double-Vs. 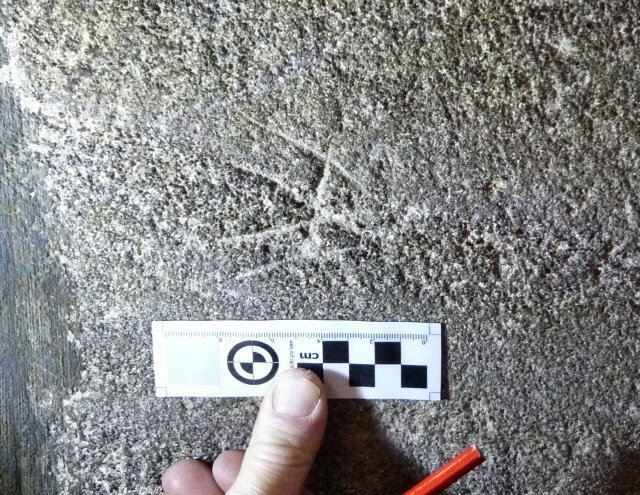 These could well be protective marks but it was difficult to ascertain whether they were made before or after the carved inscriptions (no scorch marks by the way as previously reported – we suspect it was just a trick of the light from the particular torch used). 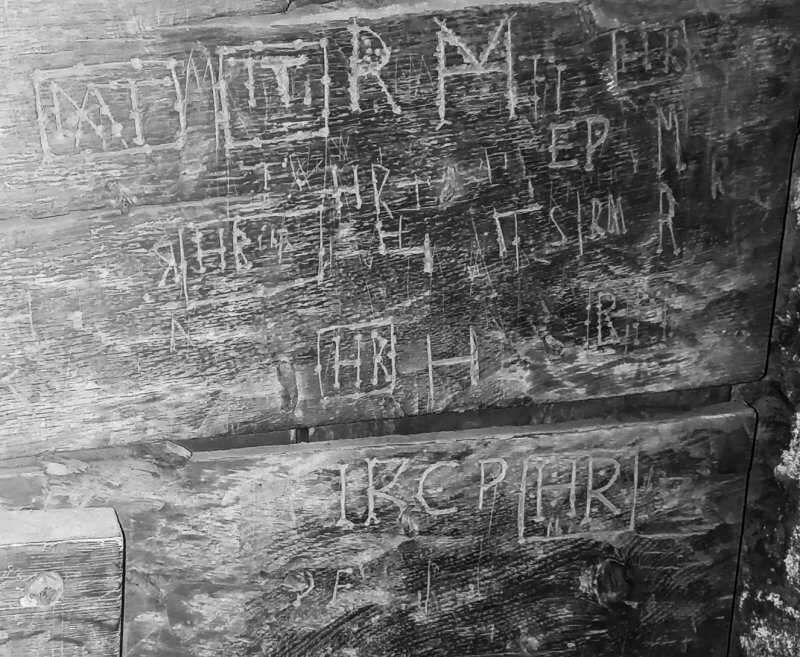 Many of the carved initials appear more than once, the most common being H R which appears 7 times. 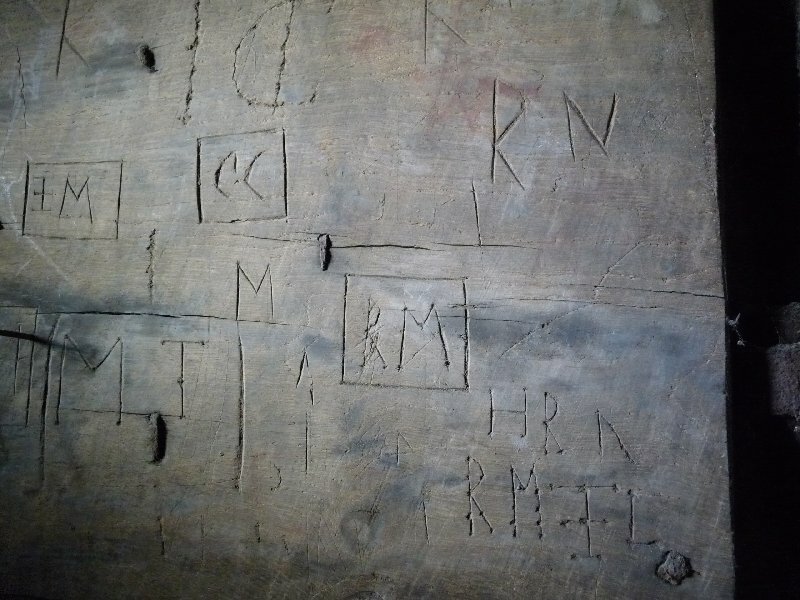 However, the variety of styles and different initials (some deeply and crudely carved, other lightly carved) suggests that possibly more than 20 individuals contributed to the number of inscriptions made. As this work could only be carried out with the door closed, it must have been done in candle light. The intricacy of some of the carving also suggests they had time to spare: with locks on the doors both top and bottom, could this tower have been used as a temporary gaol perhaps? 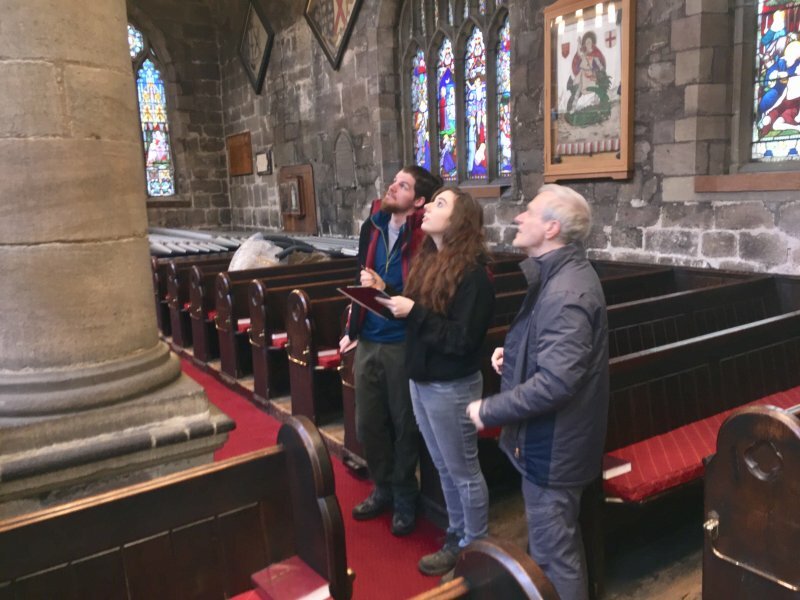 Altogether, in the church as a whole, our surveying teams recorded a total of 160 marks and took over 220 photographs, all of which have been catalogued and recorded in the report. All these, together with the recording sheets will be lodged with the Greater Manchester Historical Environment Register. After a long summer’s distraction working on our many other projects, we finally got round to attempting to finish off our Historical Graffiti project at St Wilfrid’s. 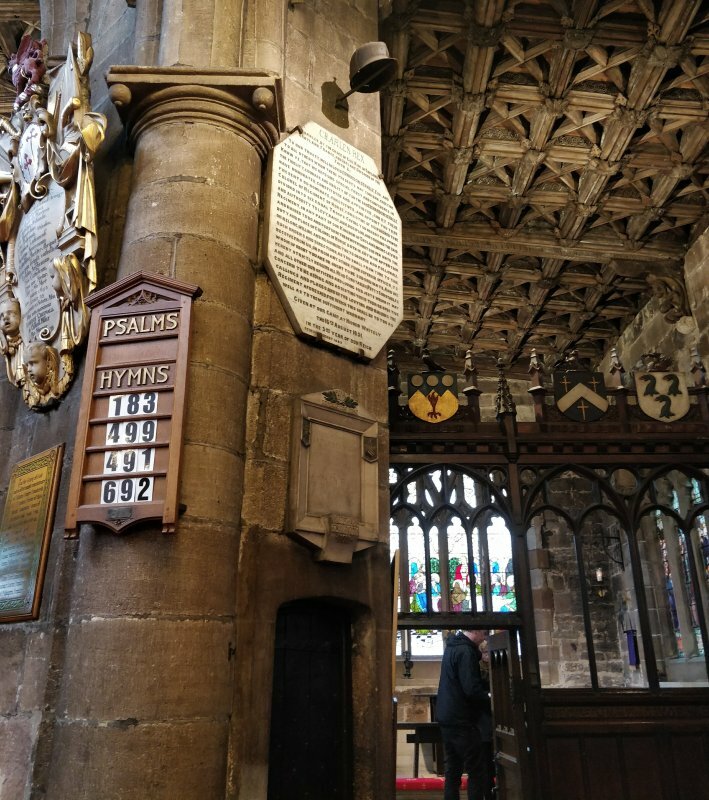 This was our third visit and the plan was to complete all the photography in the north west corner and the two chancel towers and possibly record and photograph the north tower door. On site today were Trevor, Andy, Dave North and Patrick (who joined us later in the morning). Re-identify the marks we had previously recorded took us a little while as we needed to ‘get our eyes in’ and sometimes, as before, new marks were discovered. Particularly difficult were the marks in the towers which seemed to be mainly on the back faces of the steps of the spiral stair cases. 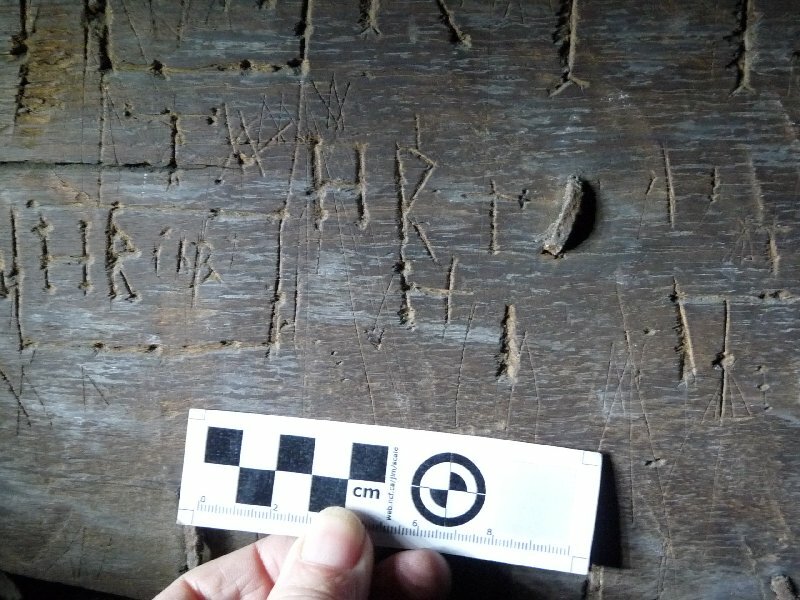 While Patrick and I busied ourselves identifying and photographing these marks, Andy and Dave did a great job recording the marks on the back of the left hand door. This was proving to be particularly difficult and a previous conversation with Carolanne (who unfortunately couldn’t attend) revealed that she had had a similar problem with a plastered wall which was also covered with overlapping marks. Her solution was to do the photograph first so that the marks could be unraveled afterwards. It was decided therefore that we would need another visit to finish the door properly on another occasion (Andy and Dave said they would like to volunteer for this task). In the meantime there was enough for me to be getting on with the report which will be made available to all members and hopefully not before too long. This was our second visit to St Wilfrid’s. 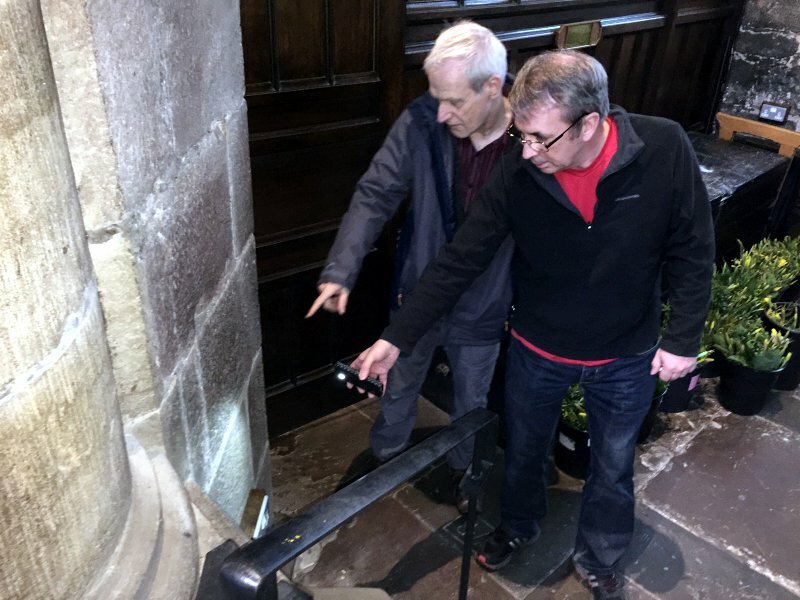 We only needed to finish photographing the marks recorded in the South Porch area and Northern quarter, at least that was the plan. 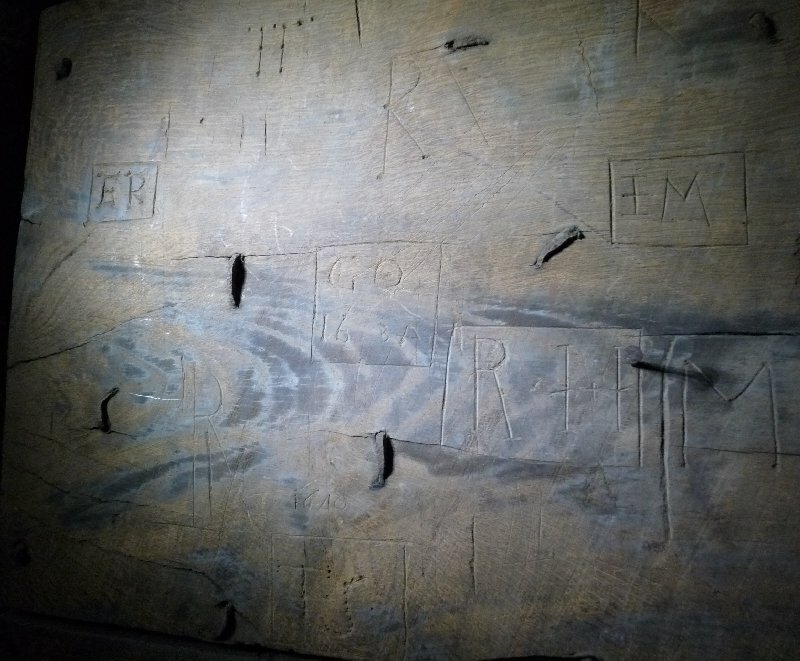 So far Carolanne King, from the GM Historic Graffiti Project, has been very impressed with our work but she also wants us to check the woodwork (as most of the it is 19th century, we had ignored it but Carolanne mentioned that often they would reuse earlier timbers). She also wanted us to look at the exterior of the building. With this in mind Trevor and Darren set about searching outside (the weather was favourable enough anyway). 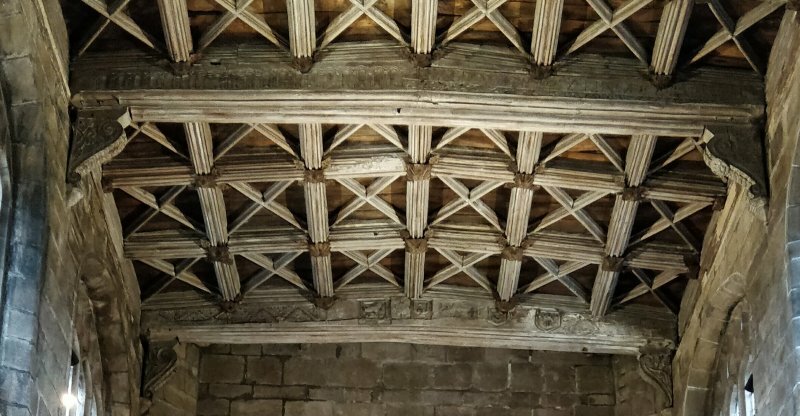 Whilst Christine, Simon, Eileen and I set about our original task of photographing the pre-recorded marks, Ashley searched through the photos of the 16th century roof timbers to see if she could identify any marks amongst the elaborate carvings. The roof is so high that this was the only way this it could be done – some tentative ones were identified but trying to locate their position proved impossible. Joe the curator also scuppering our plan by giving us access to the spiral staircases in the two turrets that lead to the roof (the roof itself remained out of bounds due to it having to be alarmed to protect it against would be lead thieves). After finding absolutely nothing outside the church, Darren joined Ashley in search of marks in the two turrets. 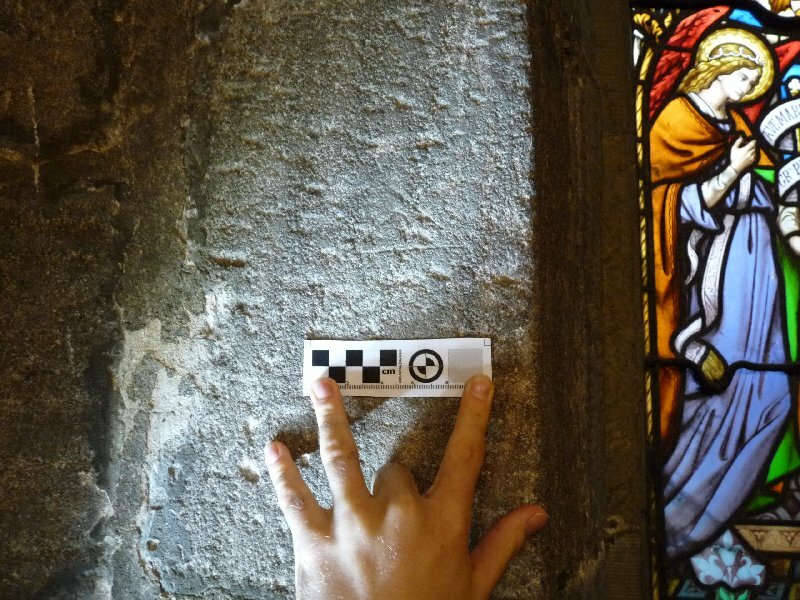 This proved very fruitful with many more marks being found on the stonework both the right and left hand turrets and particularly exciting were the marks on the door on the left hand turret. 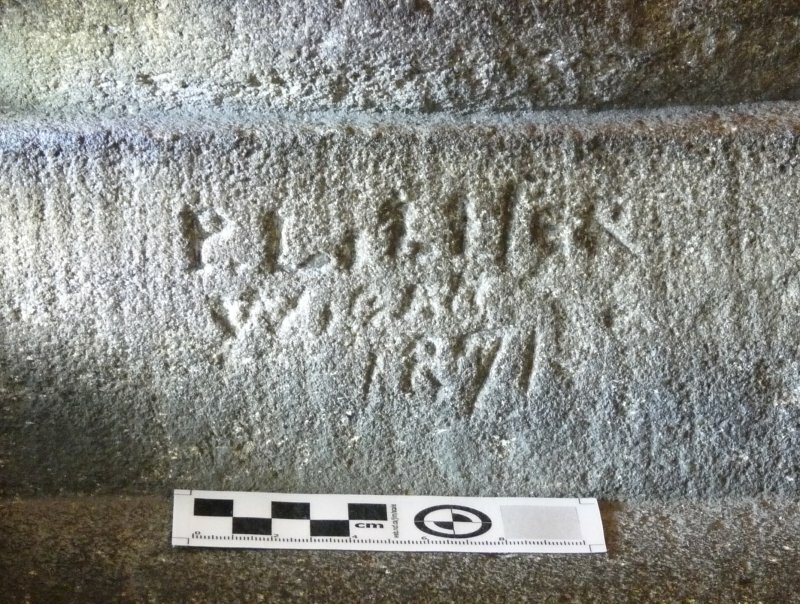 Many inscriptions were found covering the back side of this door, mainly initials but coupled sometimes with a date, the earliest being 1634 (we think). 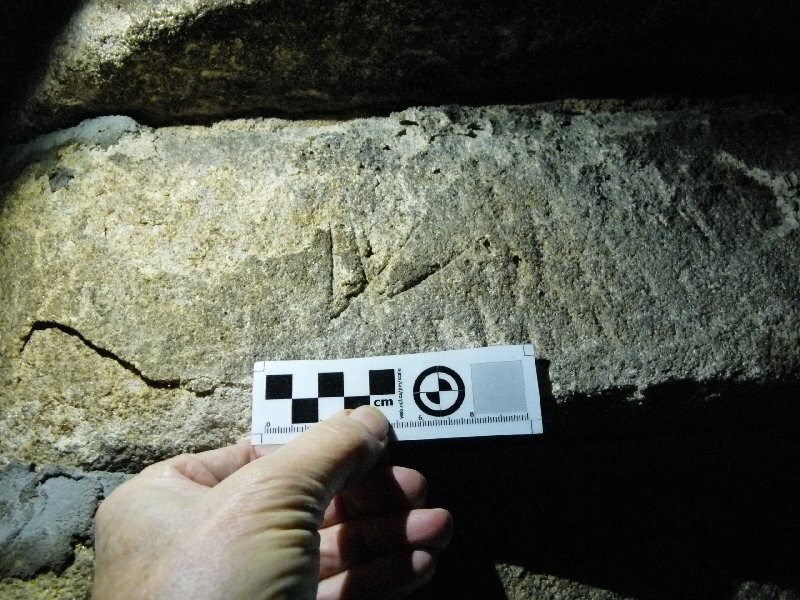 This particular inscription seemed to cut through a protective mark which might therefore be earlier (also is that a scorch mark or just a trick of the torch light?). No marks could be detected on the right hand door although both doors seemed to be original. It looked in fact like the right hand door surface had been re-cut possibly to remove all the marks. We hadn’t enough time to photograph all the new finds so another visit is called for and maybe get Carolanne and her colleague, Ellen McInnes, up to give there expert opinion. Members taking part the survey today where; Bill Aldridge, Patrick Maloney, Neil Warner, Trevor Boardman, Martin Trumble, Christine Barbour-Moore, Simon, Eileen and Ashley Brogan, Chris Gibbons, Dave Thomas. The Church, which was built in the late 16th century, is the only Grade 1 Listed building in the Wigan Borough. Our survey area was divided into five separate zones and WAS members were split up into teams of two to cover each zone. 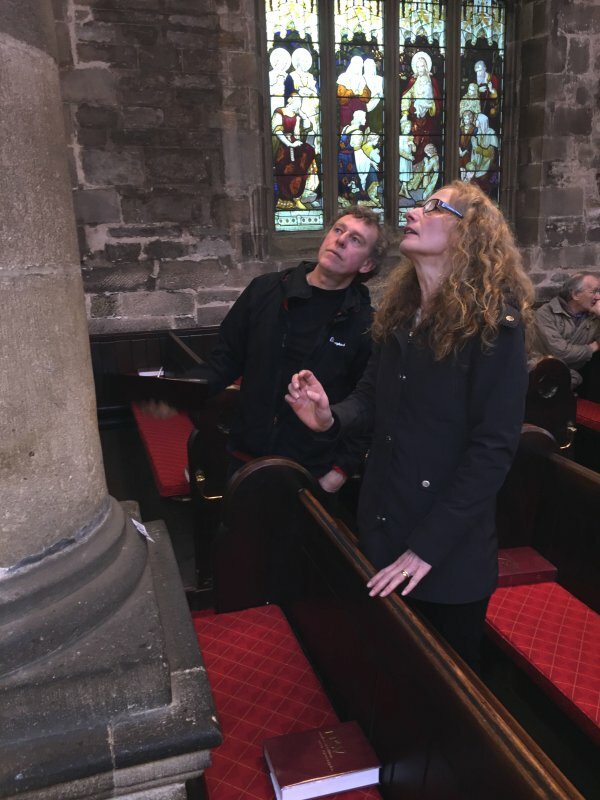 The Church’s ornate wooden roof is original but our investigation was restricted to the ground floor. We also ignored the tower and vestry which are later additions. All in all we detected a staggering 75 marks of various kinds, most prominent being double Vs, crossed double Vs although there were also many bow-tie shapes and what we are calling crossed partial bow-ties. Many were found clustered around the two spiral staircases in front of the chancel which give access to the roof. They also occurred on the walls and many of the columns of the Church. 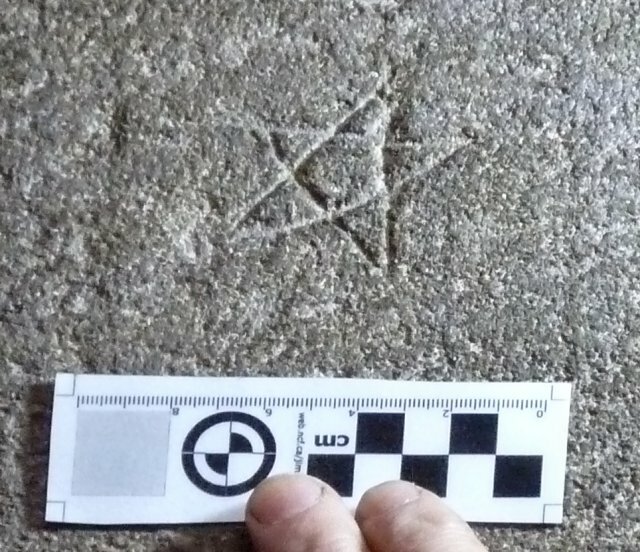 They seem to be mainly mason’s marks but a detailed study may reveal some of them to be protective markings. Protective marks are usually positioned around door entrances and windows positioned to prevent the evil spirit from entering. Detail analysis of our findings will be carried out by Ellen McInnes and Carolanne King, who are directors of the Greater Manchester Graffiti Survey. 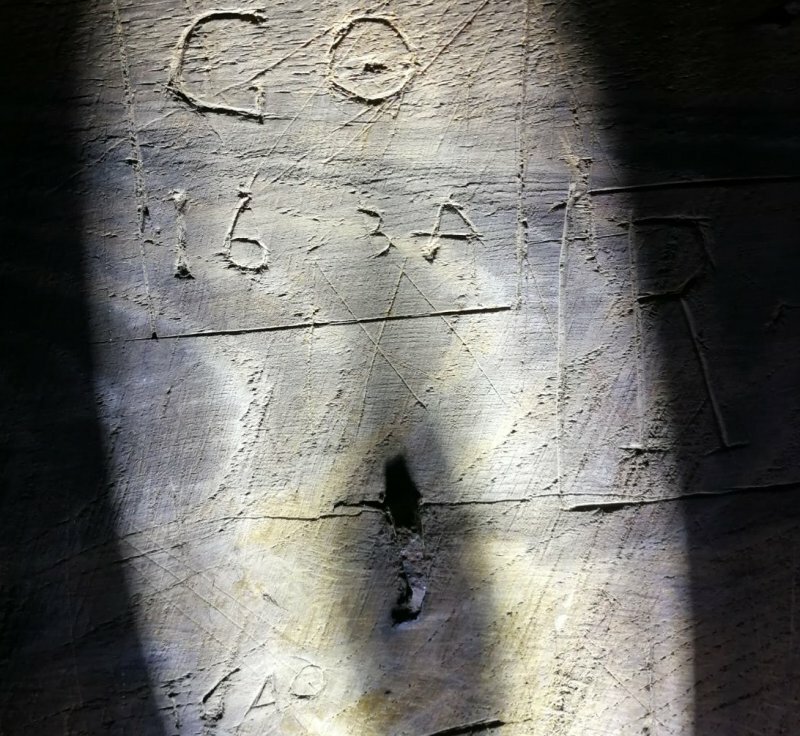 No marks at all were found on the woodwork of the Church which is where protective marks are often found. However this was not surprising, as again the majority of it is of a much more recent date. The notable exception is the side door to the Standish Chapel but this did not reveal any marks. The wooden roof of the Church is richly carved with ornate bosses and patterned beams. However this is outside the remit of the study but a examination with binoculars didn’t reveal anything. 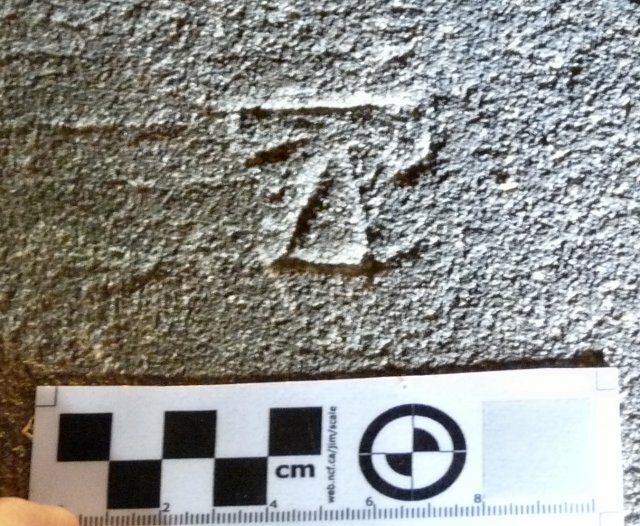 Our survey was based on the Norfolk Medieval Graffiti Survey which was the first of this type of survey to be complete. The project followed the aims of that survey but was adapted to fit the needs and circumstances of the North West. 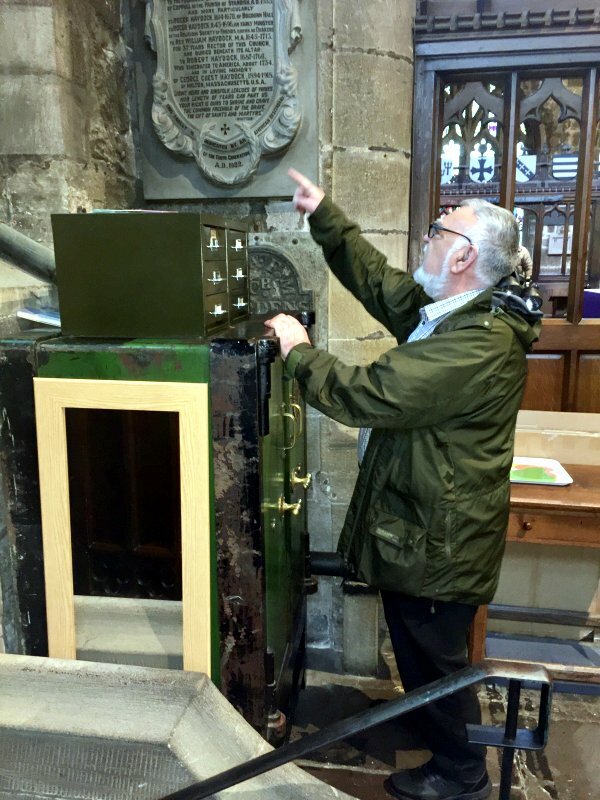 We would like to thank Joe Bazeley, Treasurer and Tour Guide of St Wilfrid’s Standish for arranging access. 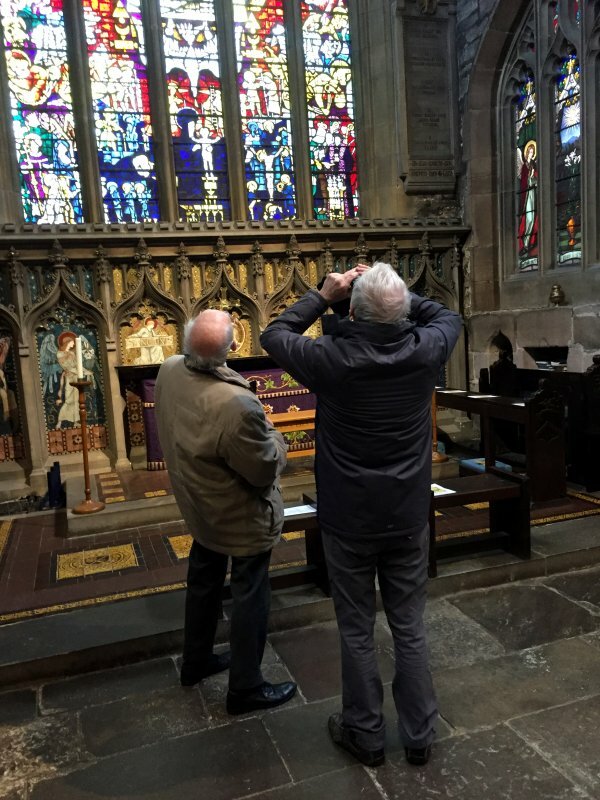 Also Joe’s in-depth knowledge of the building and history was absolutely invaluable.Thanks also to Alan, Jean and Irene Stone for their patience in presiding over the Society work carrying out the survey.